Is Bolivia’s Coca Policy Protecting Traditions, or Creating a Narco-State? 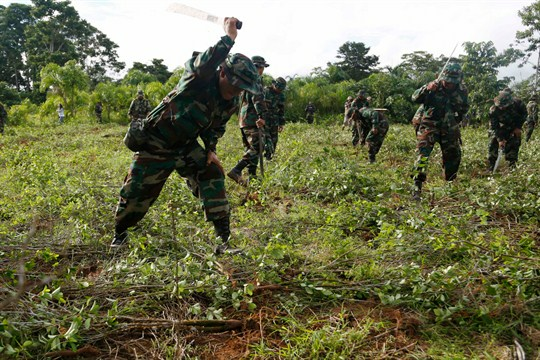 Soldiers destroy illegal coca plants with machetes during a government-organized media trip to the Villa Nueva community of Chimore, Bolivia, Feb. 26, 2016 (AP photo by Juan Karita). Editor’s note: This is the first installment of a two-part series on Bolivia’s relationship with coca, funded by WPR’s International Reporting Fellowship. The second installment can be found here.